I am slowly working on some major organization and de-cluttering around my home. It’s just really not a pretty site. If you have small children you know two steps forward in one room generally means 4-5 steps back somewhere else. Both bad babies will be in preschool this year from 8:30-12 so I will have a small window of work time that won’t be interrupted by crashing somewhere. 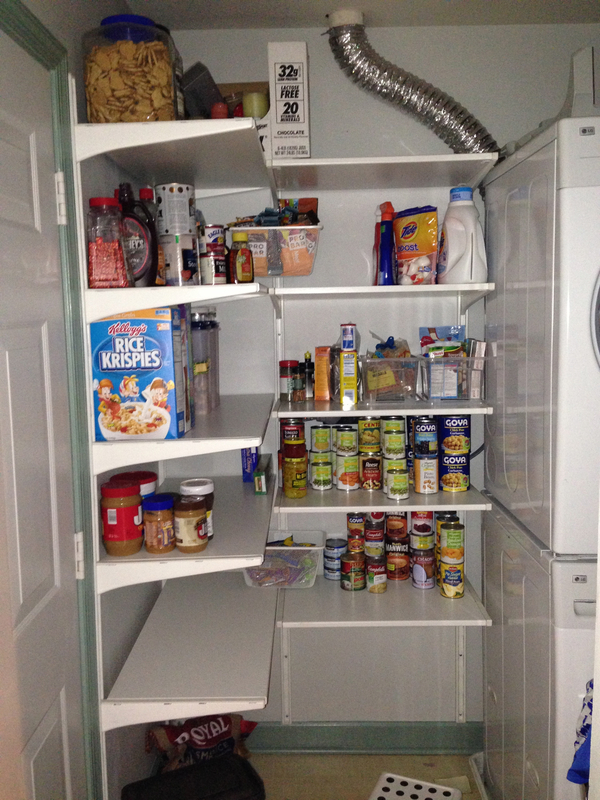 Our kitchen has a pantry. For that I am grateful. 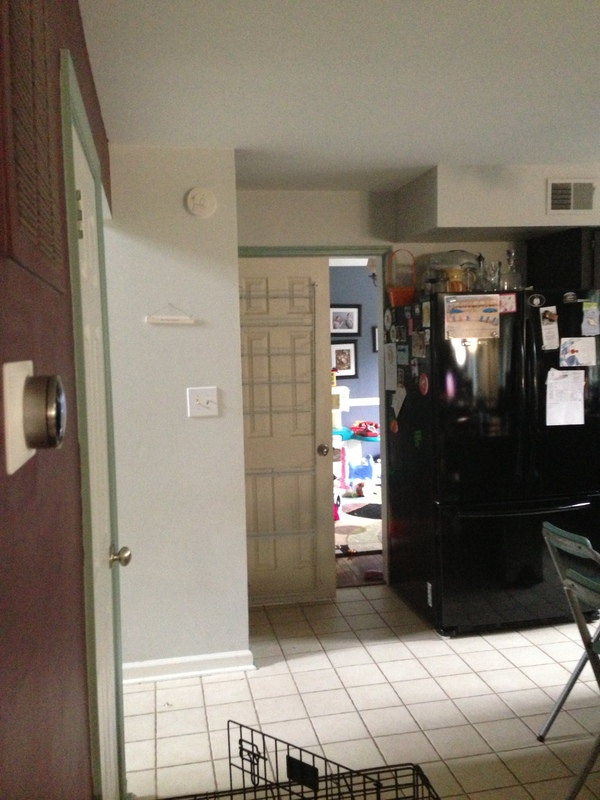 “excuse” for a pantry… by this I mean there is a door, and when you open it, There is a board that is one soup can wide and then a wall. Seriously… it’s pathetic. Mine is slightly larger than that, just inconveniently located. 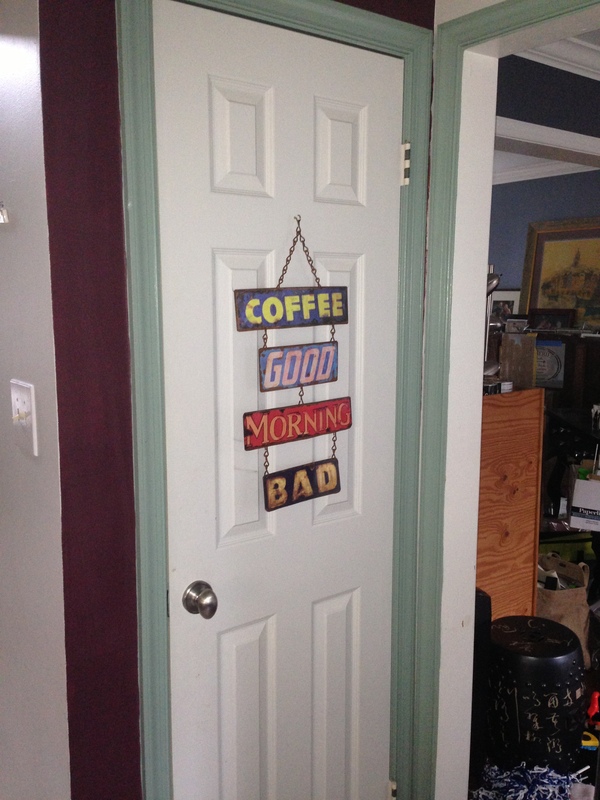 It’s on the wall in the kitchen right between the kitchen and kids playroom and the door is ALWAYS open. Honestly it makes me crazy. So a few years ago I decided I would like to move it to the laundry room. 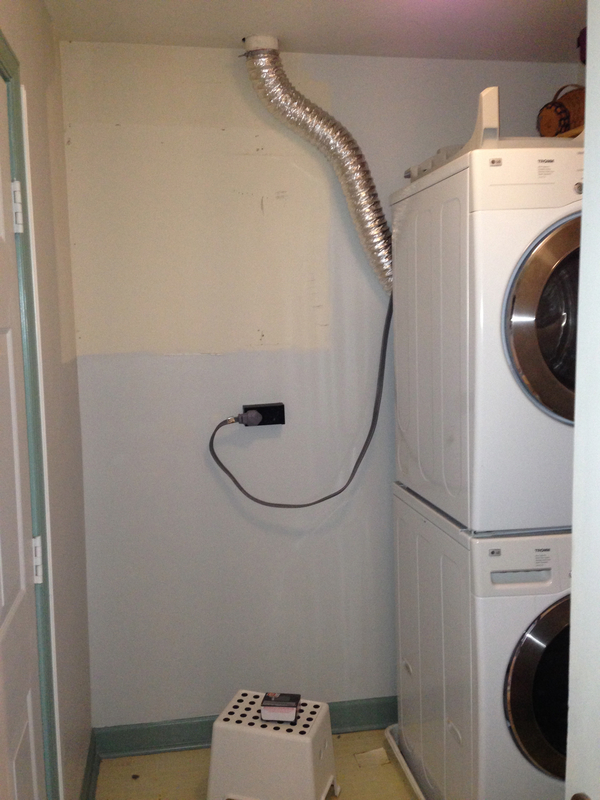 My “if I was queen for a day” idea was that I wanted to move the laundry room to the basement (ok really I wanted to move it upstairs, the basement seemed more feasible) and make the laundry room a butler’s pantry of sorts. Well, Brian talked me out of moving the washer and dryer to the basement because who wants to take even more steps when doing laundry? (valid point) and dragging them upstairs isn’t an option at the moment (I haven’t entirely given up on that one yet). 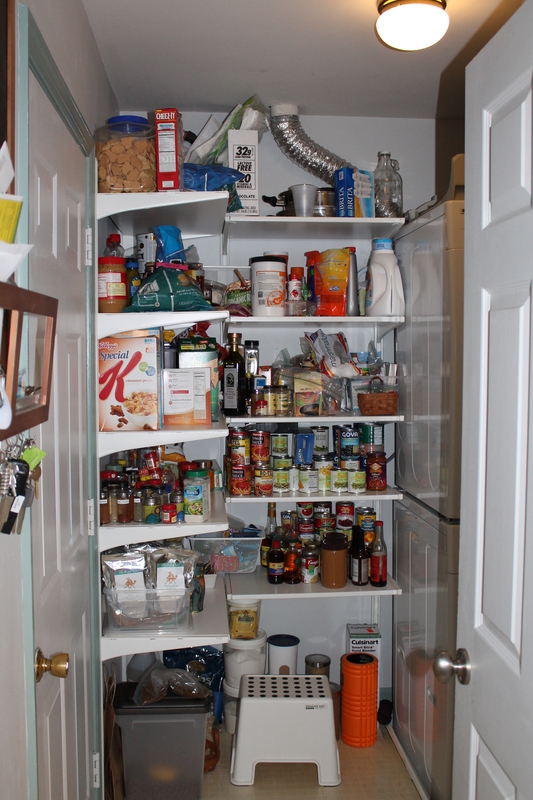 However, the pantry thing was still making me crazy. Want to know how I solved it? I waited for Brian to go out-of-town… Seriously. Then, I stacked my front loading washer and dryer (No, I did not do this myself but with help to lift them, it’s possible). I had painted around them when they were unstacked for a repair a few weeks prior so all I had to do was paint where I took out the cabinets (Yes, I forgot the “real” before photo). I went looking for shelves. Figuring this part out was the most complex. I wanted them easy to install. Ideally I would have preferred not mounting them to the wall. It was not however an option for ANYTHING I could find ANYWHERE. I had very weird measurements and I wanted to use all my available space for storage. I settled on the ALGOT system from IKEA. I found all the information on-line and sketched it out (poorly) on a piece of paper and then sent my crude drawing to Alex for his approval. Guess what? He didn’t like it. Are you kidding me? I spent DAYS thinking this out. Arghh! So I asked why-his answer? Because I could probably do it for less at Home Depot. Then you know what I did? I went to IKEA. and my kids wanted meatballs… because those things are good and they eat them. So we went. Then I got everything home and pulled it all out. I got that first set of shelves up no problem- the ones between the door jamb and back wall. Then I went to that second set. The ones along the back wall next to the washer and dryer. Guess what? My studs were in the wrong place… of course they were. 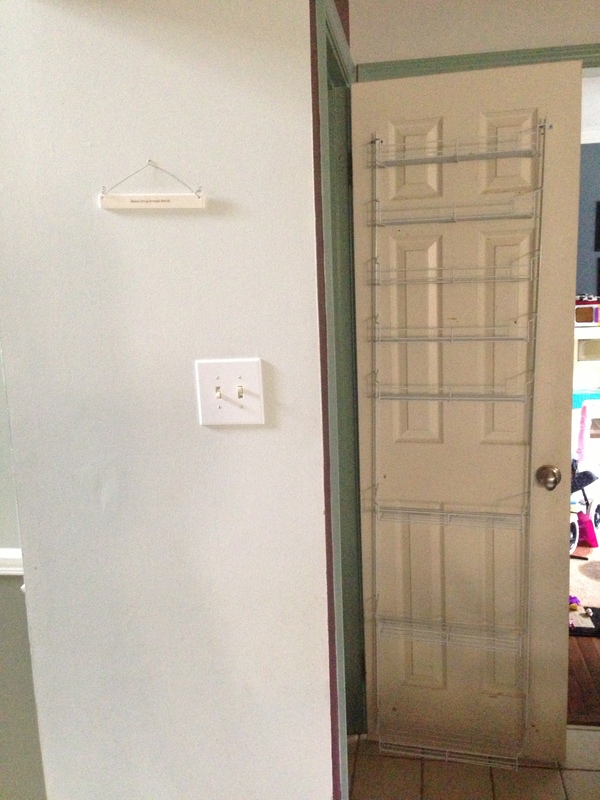 Alex said I can use drywall anchors… because I had ones that were rated for 52 lbs a piece (woot! ), and my shelves were only rated for 49 lbs each, (Woot!) and each bracket required 8 screws to hold it to the wall. WOOT! The entire thing was under $200 and only took a few hours. Now I just need a new light and flooring. Realistically I will guess the light is a more realistic goal for anytime soon. You have any ideas on that one? What did Brian think? He likes it. He still curses me EVERY time he goes to the old pantry to get something though… just WAIT till you see what I am going to do with that one!! It’s going to be AWESOME!